As the episode begins, Nenene receives two invitations to Christmas parties. The three sisters want to go to the second, a party for a recipient of an author’s award which Nenene once received. They all go, and Nenene is admonished by a senior, though she’s then defended by Lee, her editor. Later, Nenene finds out that the second party is actually a birthday party for the sisters, as they tell of how they came to be sisters on Christmas Day. The Christmas theme is barely present at all at first, but grows as the episode goes on, including the present given by Nenene to Lee and later discussions about Santa, God and Christmas. Look out for the homeless (or charitable?) Santa early the show. Making a miracle. Though Jesus is never mentioned by name, this episode contains a suprising amount of references to Christian themes, particularly toward loving others. While Anita decries the lack of miracles and wonders about God’s existence, Michelle and Maggie each decide to make their own miracles by coming to the abandoned girl. The imagery of Mary and baby Jesus is repeated and strongly infers a familial love, as well as the expectation of miracles on this special day. I’ve never watched the famed series, but if this episode is any indication of the show’s heart, I’m definitely interested. The last third of the episode is very touching, but manages to stay away from being over-the-top or corny. If you’re interested, Temporal Vortex had a nice post about this episode last Christmas. The skies should be clear for viewing a comet flying by. The ROD OVA 3-episode series is very fun – kind of James Bond meets superheroes. The followup series fell flat for me, and I didn’t even bother finishing it. The series title kept me from watching it for years since it sounds so silly, but I’ve only heard good things about the show. Now I’m really wanting to watch the OVA. 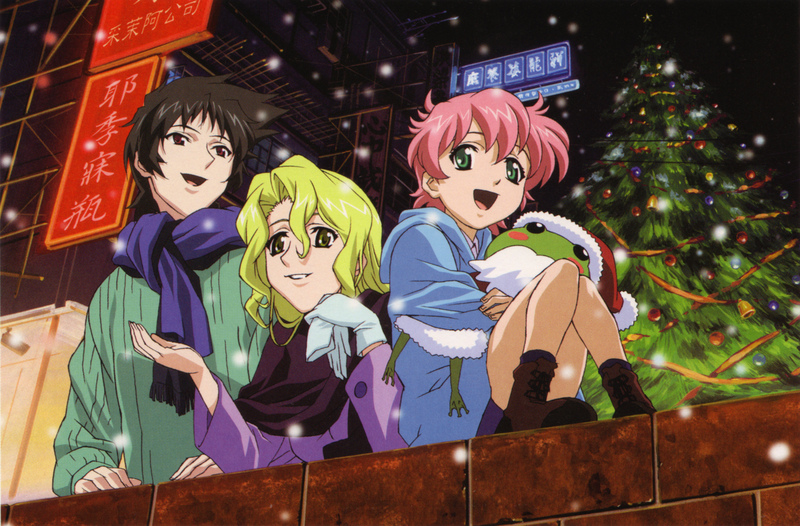 I started watching Read or Dream (aka Read or Die TV) because the OVA was outrageously fun and exciting. After watching the spectacular first episode of the television series, I thought is was going to be more of the same. However, it slowed down quite a bit but, if it had not, there may not have been an episode like the one that inspired this post. Eventually, the show did go back to its action-fueled roots after episode 12 and didn’t let up until the end. I really like series that can balance fast-paced action with thoughtful, slow, character progression…the more I hear, the more I think I should watch the OVA and rest of the TV series. This episode totally had me impressed because of it’s melodramatic approach on the meaning of Christmas. It’s definitely one of those Christmas episodes one should never miss in any anime. ROD TV is interesting on its own, but I’d say there were several parts that confused me due to heavy references to books which I haven’t read. Hmm…the series becomes even more interesting to me. I kind of like it when a show references works that are beyond me – strangely enough, that hooks me further. What’s this series actually about? I’ve heard the title a million or so times, but never actually looked into it. I’ll quote Adam from above: “The ROD OVA 3-episode series is very fun – kind of James Bond meets superheroes.” The British Library actually hosts an intelligence agency in this series.